Okay, so putting aside the reach around jokes involving the title and the fact that the badass hero of the film is a mere 5ft 7, the fact of the matter is Jack Reacher is written and Directed by Christopher McQuarrie and stars Tom Cruise who [despite his day-to-day antics] is a powerhouse producer and actor. So with all of that in mind, does Jack Reacher succeed as an action thriller with smarts and intrigue? Jack Reacher begins with a shooting, more specifically a man with a rifle aiming and firing at innocents in public from a car park compound, resulting in six dead and a gun happy yet innocent army man, Barr (Joseph Sikora) being arrested and kept in custody. His only request - ’Call Jack Reacher’. 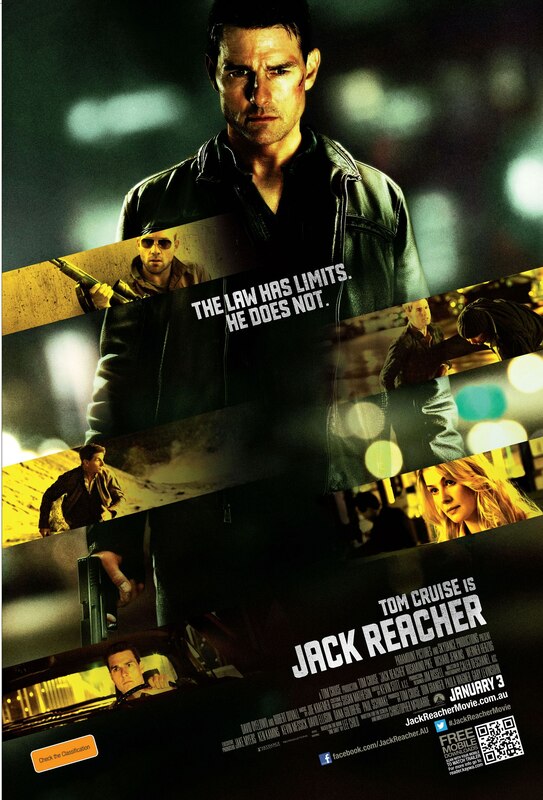 Jack Reacher (played with familiar confidence by Tom Cruise) arrives in town hoping to settle a debt with Barr, but instead finds himself solving the case along with Barr’s lawyer, Helen (Rosamund Pike). Jack is not a cop or a criminal, he’s merely a drifter with charm and experience who knows Barr in some way yet delves deeper in finding answers, even if the questions are unclear. Christopher McQuarrie is most famously known for writing that sharp, revelatory and original screenplay, The Usual Suspects which he won an Oscar for. However, as a director, his name’s unfortunately not as renowned. I genuinely hope Jack Reacher puts him on the map as a director, putting aside the film’s screenplay (based on the novel, One Shot by Lee Child) the direction, in terms of performances and visual flair, is outstanding. The timing throughout the film is fantastic, and the precision execution of the action set pieces is the sign of a director who knows performances and a space all too well. Although some of the writing isn’t consistent at times, the film also has a real story to work towards, which doesn’t refrain from plot development or simply focus on great performances in hopes they’ll carry the film. It’s a refreshing change. Tom Cruise knows how to give it his all. Say what you will about him but he’s still a great actor, and I doubt many could deny that. On the surface, Reacher is a cold, emotionless character who walks around looking cool and being badass. However, with Cruise in almost every frame, Reacher is a mysterious guy who also has compassion underneath the grit and confidence. The movie and his performance confirm this, and make him a character we instantly like and admire. There is coldness to the character that does take time to thaw, but with a story like this, it’s worth being patient. Amidst the praise, Jack Reacher is not a perfect film, or perhaps even a great one, but it does everything it sets out to do and is one of the better films of its “blockbuster” ilk. The screenplay has its flaws though, some of which consist of less than complex villains and a few predictable turns. Rosamund Pike, although pretty satisfactory has a few phoned in reactionary moments which bring her performance down – not by a lot but moments that pale in comparison to the rest of the cast. Speaking of which, Robert Duvall has a small but fun role as a gun range owner who laughs…then coughs uncontrollably in the face of danger and sharpshooting. Kudos to McQuarrie for utilizing such a great actor when many other directors these days do not. It’s fun, inventive, and at times exhilarating and surprisingly gritty. Some one liners are funnier than a decent slew of comedies released this year, thus making Jack Reacher an incredibly fun experience. Hollywood directors take note, this is how you make a good film without succumbing to highway chases and stacks of napkins that are referred to as “the screenplay”. Well done Mr. Cruise and Mr. McQuarrie, well done. You may also want to have a peek at these reviews: Skyfall, Need For Speed: Most Wanted, The Master.